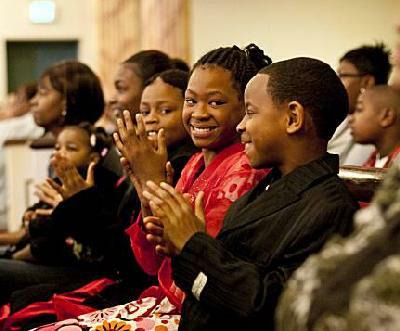 Jasmine Turner (center) and Larry Oliver (right), both age 11, attend the Super Sunday service at West Oakland's Greater St. John Missionary Baptist Church. *The pulpit at many black churches has become a place to pray to a higher power – and praise higher learning. “The future belongs to those who believe in the beauty of the dream of reaching the promised land- with education!” cried the man addressing the congregation Sunday at Greater St. John Missionary Baptist Church in West Oakland. The words came not from the pastor, but from the president of California State University East Bay, Mo Qayoumi, whose remarks were also carried live on KDYA the Light, a gospel radio station. On Sundays throughout February, Qayoumi and other university leaders are fanning out to more than 100 black churches across the state to spread the gospel of higher education in a program they call Super Sunday. They’re aiming their message mainly at the families of middle-school children, preaching the idea that it’s never too early to prepare for college. He was talking about getting more kids into CSU’s five-week “algebra institutes,” free summer programs for middle and high school students that focus intensely on math but include visits to companies so students can see engineers and other math professionals at work. Get more of this story HERE.